Anyone planning on visiting Hermanus, should give Sixteen Guest Lodge a try if they are looking for accommodation. Beautiful rooms, beautiful surroundings and excellent facilities will make sure you have a wonderful stay. This is a standard static website, using html and css, with some jquery pages thrown in. I covered everything from the design to the coding stages and also linked up their booking systems and did their facebook page. 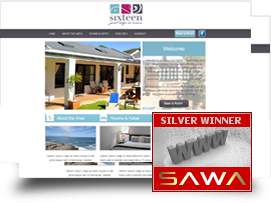 Sixteen Hermanus has won Peppermint Design’s second Silver South African Web Award.